The ‘Boat’ is 150cm (5′) w ide, 175cm (5’10”) long and 65cm (2’2″) deep. Big enough for adults, it is also quick to fill, heat and empty. It is ideal for churches meeting in borrowed premises or where a quick set-up / take down is needed. All our hexagonal and round pools are also ideal where the candidates have mobility issues. The new Violin-shaped baptistry has been specially designed for pastors who do not want to be in the water. 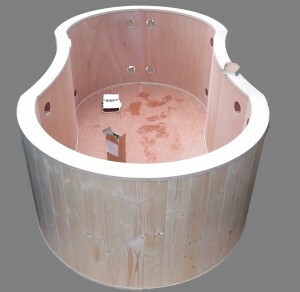 The Pear-shaped baptistry is a lovely piece of furniture, handmade in wood. It is sturdy and robust but is a lot heavier to carry and bulkier to transport and store (you will note this from the delivery price). It comes in 4 pieces that wingnut together and can have a single or double liner system. It comes with all equipment as above , an optional extra is the wooden lid making a beautiful table/altar. The large pearshaped is 5 foot wide and internally 6 foot 6 inches long, it is also 90cm high. It comes in six pieces that wingnut together. Another lovely piece of furniture.